COMPETITION: Win Victoria series one on DVD! 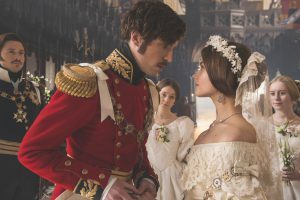 Victoria has just finished airing on ITV, and it’s safe to say Jenna Coleman’s portrayal of one of the most interesting and influential monarchs of British history has enraptured viewers at home. The ambitious eight-part dramatisation followed the early life of the great Queen Victoria, from her ascension to the throne at the tender age of 18 through to her courtship and marriage to Prince Albert. Coleman’s nuanced portrayal of the iconic ruler has been faultless, as she depicted Victoria taking her first faltering steps from capricious, hormonal teenager to respected ruler. As well as chronicling the monarch’s public life, viewers got an intimate insight into her private life, illustrating Queen Victoria in a way we have never seen her before. To celebrate the release of Victoria on DVD today (October 10), we’re offering TVGuide.co.uk users the chance to win one of three DVD boxsets! This competition closes on October 24 and is only open to UK applicants. Please see full Terms and Conditions here. Victoria is available now on digital download and on DVD on Amazon and iTunes.